Spread the Vote – In the state of Texas, you have to have a government issued photo ID to vote. Are they registered to vote in Texas at their current address? Not sure? Check at the TX Sec. of State site or at Vote.org. Yes! Great, skip to the next step to make sure they have the necessary ID. Still in the same county? Update registration online (this page is not mobile-friendly, and you need to have your voter registration card on hand to complete your change of information). Now in a different county? Register in the new county by Tuesday, Oct. 9th. Do they have the ID required to vote in Texas? Not sure? Check which forms of ID are acceptable and more on voting with or without them at ACLU of Texas or Spread the Vote Texas. Yes! Great, skip to the next step to help them make a voting plan. Yes, but it expired. Make sure it expired no more than four years before voting day. No, and they need to get one! 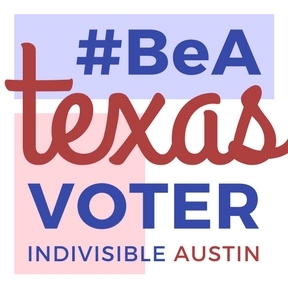 Text (713) 496-0570 to connect with Spread the Vote, which obtains IDs for eligible voters, paying related fees (“for 365 days a year PLUS election day”). Do they have a voting plan, including what to bring, where and when to vote, and transportation to the polls? Completed sample ballot (recommended) – Ballots can be lengthy, and while cellphones are to be turned off at a polling place, paper notes are allowed. League of Women Voters’ fillable, printable sample ballot is available closer to Election Day. Travis County’s 2018 ballots are available now. If early voting, at ANY early voting location in the county of residence (Travis County; Williamson County; Hays County; Bastrop County); polling place hours vary by early voting location. If voting on Election Day, locate your polling place; Election Day voting hours are 7:00 a.m. to 7:00 p.m. at all polling places statewide. Want a reminder? Complete this form (physical and email addresses required; mobile number optional, and will be used to text reminders).